is the perfect solution for individuals and small workgroups. It combines speed, reliability and ease of use with high-quality color and four-in-one functionality"all in an affordable desktop device with a footprint small enough to fit easily into your work space. It has fast print and copy speeds"yet, with HD Color printing technology and a print resolution of up to 1200 x 600 dpi, theres no trade-off of speed for output quality. Multi-level printheads and microfine toner provide more detail, greater color depth, and reduced grain for breathtaking output even on ordinary office paper"while Auto Color Balance ensures color consistency across all jobs. Single Pass Color technology provides a straight paper path with fewer moving parts, allowing for smooth paper handling and higher speeds while ensuring greater reliability. Versatile scan-to capabilities " Turn hard-copy documents into electronic files by placing them in the automatic document feeder (ADF) or directly onto the flatbed scanner, and scanning them in black & white or color. Scan a document directly to a locally attached PC or to the shared directory on the network (without the need for additional software), to an e-mail address, to an FTP site, or as an attachment for a fax. Or simply insert a USB memory stick into the port conveniently located on the front of the unit, save your scan to the memory stick, and youre on your way in seconds. A full-featured fax device " The MC360 MFP comes with a number of fax features found in more expensive units, including Tel/Fax auto switching, a telephone answering device (TAD) interface, speed-dial ID display, and generous fax memory. Its dual access functionality lets you perform two tasks at the same time. 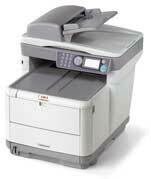 Enhancing productivity " The MC360 MFP is quite user friendly. Its network-ready right out of the box and has an intuitive operator panel thats simple to use and a backlit LCD display that's easy to read. It also comes with several useful software utilities: the OKI Hot Key desktop application reduces common tasks to a single click; PaperPort and OmniPage from Nuance convert scans into workable, transportable digital files and provide feature-rich OCR capabilities. The banner printing capability and media versatility of the MC360 MFP mean businesses can lower costs by producing more professional-looking documents in-house. And, with a duty cycle of up to 35,000 pages per month, this durable device can be relied upon to handle large daily print and copy volumes.